The title of this piece and the logo to the left are meant ironically. Not because finding a place of rest isn’t something we all need but because it’s hard to imagine that McDonald’s is the place where that would happen. It stands as a model for consumerist culture, processed food, and homogenization of experience. It operates by sharing manufactured feelings and sentiments that fall far short of an actual restful repast. The existence of departments in Oak Brook, Illinois tasked with creating those feel good moments that don’t quite satisfy is testament that McDonald’s is hip to the game. 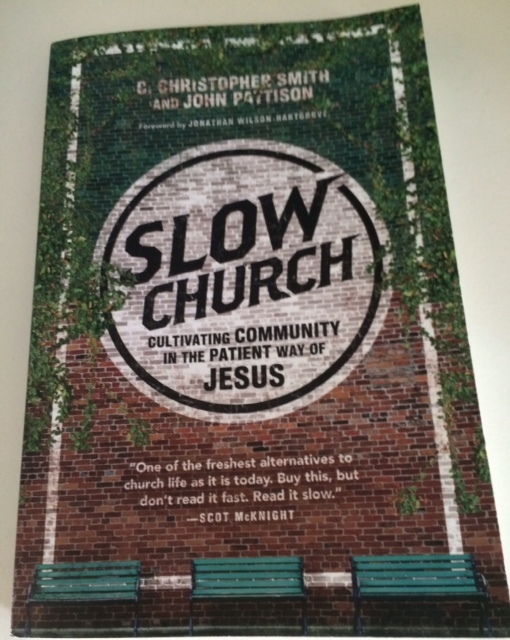 I just finished reading Slow Church: Cultivating Community in the Patient Way of Jesus by Christopher Smith and John Pattison. I had expected to enjoy the book and it didn’t disappoint. Of course, I’m more than a little biased. Chris comes from my hometown of Indianapolis. John hails from Silverton, Oregon having relocated from Portland where I spent over a decade. Check out their blog on Patheos. The book draws heavily from the work of sociologist George Ritzer who has been talking about the “McDonaldization” of society for a long time. Ritzer expands the bureaucratic thinking of Max Weber by showing how issues of Efficiency, Calculability, Predictability, and Control shape expanding sectors of our economy. We do what we do because we’re conditioned by institutions to adjust our expectations to what works best for them. The point of Chris and John’s book is that we’ve done the same with church, especially the evangelical variety. Follow lessons from the Church Growth movement, pepper in some tightly predictable orders of service, keep the “worship time” alive and happening (at least for the worship team), have a 25-40 minute sermon celebrating certainty, and stick in a legitimized “passing of the peace” (which isn’t quite long enough for connection) and we have a “spiritual experience” that is efficient, calculable, predictable, and controlled. And we don’t feel any more spiritually alive after that. Just like I don’t feel like I’m relaxed because I took “a break” at McDonald’s. As they move through the book, it seems that they are moving from exterior environments to more interior ones. They begin by identifying a notion of placedness (Near Northeast Indianapolis is a specific spot as is Silverton, OR). One can’t simply homogenize religious experience as if place doesn’t matter. Franchise operations feel different from local restaurants. Second, they explore the combination of relationship, work, and sabbath which weave together in intricate ways. The most interior section of Slow Church focuses on the abundance present in a group of people, our gratitude for what people bring to us, and our hospitality in sharing lives together. These culminate in a broad understanding of Eucharist as people sharing their blessings and their stories because they sit in common relationship to others (drawing on Dietrich Bonhoeffer and Parker Palmer). As evangelical churches have grown in size and we’ve even moved to multi-site, satellite congregations, we’ve recognized that we have a very different form of religious organization than the ones present 50 years ago. Those churches would be far more varied, much more interactional, and would be the place where one connects within the community. No so much anymore. We recognize the impact of this franchise operation. It makes for a religious organization that is based on sameness of message and music, autonomy and individuality. While designed to be “seeker sensitive” it is far too often isolating. So we create highly structured small group ministries to allow people to find their place, to be known by some set of others. Sometimes we structure the leadership of those small group settings so that people have parallel experiences regardless of which group they attend. As I finished Slow Church and reflected on the importance of what Chris and John call “Dinner Table Conversations” I came away with the idea that maybe we have everything backwards. Instead of aiming for predictability and control, we should be embracing messiness and authenticity (Chris has written about the years-running Sunday night dialogues at Englewood Christian, which were anything but homogenous). Maybe when we organized our sanctuaries to look like concert venues we made the wrong choice altogether. Maybe the model is more like participatory dinner theater. Imagine a sanctuary where people sat at tables. After the morning coffee, updates on one’s week, you’d have some music. Then a table prayer. Some scripture reading around the table. An opening presentation by the preacher to prompt thinking. Discussion around the table of the implications of the opening. Questions posed by the tables. These could be incorporated into the second part of a more formal sermon. The service would end with music, a sense of commitment for application, lunch, and going forth into our community. As I write this, I realize that this is very much like a Wesleyan Class Meeting that puts the common meal at the center. Such a gathering would allow people to explore questions, share their authentic identity, and experience what it means to be the Body of Christ. I wonder what could happen. Tomorrow, I’m participating in a meetup for people disillusioned with church. I plan to test some of these ideas if the opportunity arises. For now, I’ll just work on slowing down.